After Germany had already conquered Poland, Denmark and Norway, it went to war with the Netherlands, Belgium, Luxembourg and France as well, in May of 1940. Within weeks Germany had defeated these countries as well. Only Great Britain was able to remain in the war, after having the mainstay of its expeditionary force retreat from Dunkirk back to British soil. In the summer of 1940 Germany attempted to gain air superiority over British skies in order to allow its fleet safe passage to invade Great Britain. However, the German Luftwaffe failed to defeat the Royal Airforce and the Germans postponed the invasion. Germany instead focussed its attention on the east, aiming to defeat the Soviet Union in a brief campaign. The German offensive against the Soviet Union however, ground to a halt near Moscow near the end of 1941. This forced Germany to fight a prolonged war on two fronts. 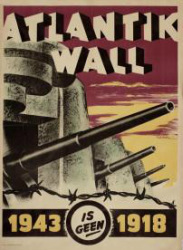 Propaganda poster for the Atlantikwall. Source: Beeldbank WO2 - NIOD. In the east, the Soviet Union offered fierce resistance and in the west remained the yet undefeated nation of Great Britain. In order to make as much troops as possible available to fight in the east, the German army sought to compensate for a reduction in manpower by building massive fortifications. Many important areas along the Atlantic coast were fortified. 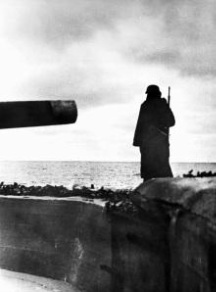 After several British raids on the Atlantic coast in 1942, Germany decided to systematically fortify the European coast. Thousands of bunkers were built along a line stretching from the Franco-Spanish border to Norway. This line of defence, measuring about 5000 kilometres (3107 miles) in length, was given the name ‘Atlantikwall’, literally ‘Atlantic wall’. 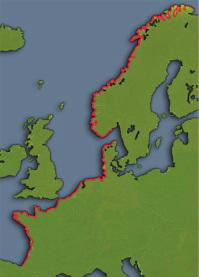 The Atlantikwall along the European coast.